Updated 9/16 at 12:00 PM ET. Removed Josh Gordon and DeVante Parker. Re-added Paul Richardson, added Antonio Callaway. Ticked Jarvis Landry up. Moved Seahawks defense down. Ticked Derrick Henry down. 9/16 at 12:45 PM ET. Moved Marcus Mariota further down based on pre-game reports. Making his first career start, James Conner handled a monumental 36 touches against the Browns. He turned them into 192 yards from scrimmage and a pair of touchdowns. No other Steelers running back played a snap. It was as if Le'Veon Bell never left. 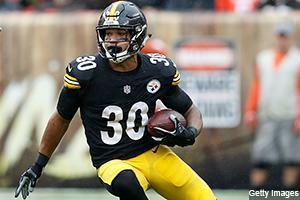 With Bell not returning for Week 2, Conner gets to follow up his dream day with a dream matchup. Another 35/192/2 probably isn’t the offing, but the Chiefs are more than ready to make another high-end RB1 day happen. Andy Reid’s defense surrendered 123 yards on just 22 carries (5.59 YPC) against the Chargers and coughed up a ridiculous 14/189/1 to Melvin Gordon and Austin Ekeler through the air. Both the highway and the skyway will be open. Even if he makes only a handful of starts, Conner’s early-season impact could make him a league-winner in the long run. QB Notes: Drew Brees’ 439 yards against the Bucs were 54 more than he had in any 2017 start. The Browns battered Ben Roethlisberger in Week 1 but had the benefit of wind and rain. It will be 72 and “sunny” in the Superdome. … As for Roethlisberger, his 22.8 QBR against the Browns was his lowest since Week 14 2016. The Chiefs’ talent-less defense promises to be a slump-buster for the Steelers’ home debut. Philip Rivers’ pass catchers dropped scores of 39 and 21 yards last Sunday, and he still ripped the Chiefs for 424 and three. … Cam Newton had a quiet day in a dull affair with the Cowboys. Things should be livelier against a Falcons defense adjusting to the loss of both SS Keanu Neal and MLB Deion Jones. You typically don’t want to lose your run-stopping safety and middle linebacker the week Newton comes to town. … Patrick Mahomes was as advertised against the Chargers, finding Tyreek Hill for gains of 58, 30, 20, 21 and 34 yards while flashing various looks as a runner. The Chiefs called both traditional and read option plays. Mahomes is going to have high-turnover performances, but his big-play skill-set and every-worthy arsenal of weaponry are going to make him an every-week QB1. With an over/under of 52.5, shootout conditions are brewing in Pittsburgh. Jimmy Garoppolo posted a modest 261 yards against the Vikings’ elite defense. It should have been so much more. George Kittle dropped what could have been an 80-yard touchdown in the third quarter, while Garoppolo had some uncharacteristic misses. Now headed home, he’s facing a Lions squad that got smithereens’d by a Jets offense starting the youngest Week 1 quarterback in league history. … The Packers are going to “will he or won’t he?” Aaron Rodgers’ knee issue for as long as possible. That’s just what they do with injuries, especially when it comes to their quarterback. Even if Rodgers has real knee damage, it’s extremely difficult to envision him sitting after he carved up the Bears on one leg. The biggest concern is his foreboding matchup in the Vikes. … Kirk Cousins was solid if unspectacular against the 49ers. A floor day is likely against the Packers’ middle-of-the-road defense. … Alex Smith’s 255 yards and two touchdowns against the Cardinals were nice, but he would have had a lot more had the game been competitive. The Colts should keep it closer than Arizona but also have a (far?) worse defense. Smith’s patented 280/2 seems on the way. Editor's Note: Looking for a weekly edge in your fantasy leagues? Get the Rotoworld Season Pass for projections, early-week rankings, WR & RB reports, exclusive columns and chats with our experts and much more for just $19.99. Deshaun Watson’s Week 1 went about as poorly as possible. The healthy return of Will Fuller (hamstring) would be a big boost against a Titans defense that struggled to pressure Ryan Tannehill. … The Bills looked like an expansion team in Baltimore. Philip Rivers is making one of the longest road trips in football against a defense that is going to be angry after last week’s embarrassment, but there is every other reason to expect a strong QB1 day. That’s if the game does not get out of hand early. … Jared Goff missed too many easy throws against the Raiders. That’s despite the fact that Jon Gruden’s squad generated only three QB hurries. Goff should have the requisite volume against the Cardinals, but he needs to be more efficient. … The QB8 on the road against a tough Broncos defense, Russell Wilson must now venture to Chicago without Doug Baldwin (knee). Khalil Mack terrorized a Packers offensive line that is twice as good as Seattle’s. QB12 might be too much benefit of the doubt. … Matthew Stafford was patently horrific against the Jets. Gang Green said they knew which plays were coming. Hopefully OC Jim Bob Cooter changes up the hand signals and verbiage for this week’s road trip. The Texans kept the lid on the Patriots’ offense, limiting Tom Brady to a QB9 day. Brady ripped the Jaguars at home in the AFC Championship Game, but expectations must be tempered against Jalen Ramsey and company on the road. … Andrew Luck’s average depth of target was 5.7 against the Bengals. It has never been below 8.1 in any given season. We are looking at a different player until Luck regains his strength/confidence. … Yes, the weather was bad. That doesn’t mean Tyrod Taylor gets a pass for completing just 15-of-40 throws while taking seven sacks in five quarters against the Steelers. The matchup is compelling in a Saints defense that got clownsuited by Ryan Fitzpatrick, but Taylor is too boom/bust to rank any higher. … It is reasonable to expect 260 yards and two touchdowns from Case Keenum against the Raiders’ barely-there defense. … Going by QB rating, just 10 of Matt Ryan’s 159 career appearances were worse than his showing against the Eagles last Thursday. Ryan has traditionally found the holes in the Panthers’ zone defense, but there is only so much enthusiasm to be mustered for a quarterback with 20 touchdowns over his past 17 starts. Sam Darnold did a nice job alternating checkdowns and deep balls against the Lions. He can already be trusted as a floor play in two-quarterback leagues. … Marcus Mariota is running out of excuses. Now he’s missing his security blanket in Delanie Walker. The Texans were reasonably stout against Tom Brady. It could be another long day for the Titans’ fourth-year starter. … Ryan Fitzpatrick was the best quarterback in the league in Week 1. That lightning isn’t going to strike twice against an Eagles pass defense allowing 227 yards per game since the start of last season. … Week 1 featured nothing but negatives for Dak Prescott. He had no weapons, and his line couldn’t block. If you’re looking for something to hang your hat on, Prescott’s best 2017 performance came against the Giants. ... Playoff Nick Foles has retired. … Eli Manning looked washed against the Jaguars. That’s to be expected. It will be a crisis if that remains the case against the Cowboys. … Mitchell Trubisky was horrible against the Packers once the script ran out. He completed 15-of-26 passes for 72 yards (2.76 YPA) over the game’s final three quarters. He’s going to need four quarters worth of Andy Reid-level play-calling to be worth starting in two-quarterback formats. … Derek Carr was unconscionably bad against the Rams. … Josh Allen — our thoughts are with you. Don't forget, for the latest on everything NFL, check out Rotoworld's Player News, or follow @Rotoworld_FB or @RotoPat on Twitter. RB Notes: Todd Gurley hit his 2017 touch average (23) against the Raiders while coming eerily close to his 2017 YFS average (140). There will be no Fishering under Sean McVay. … Alvin Kamara was otherworldly against the Bucs, finishing as the RB1 as he piled up 141 yards from scrimmage and three touchdowns. He did so on only 17 touches (eight rushes). Now he gets a Browns defense that got smashed by all-purpose back James Conner. … Ezekiel Elliott managed just 15 Week 1 carries for the Cowboys’ lifeless offense. Even with his run blocking a mounting concern, the Cowboys have no choice but to get that number above 20 for Week 2. Elliott has cleared 100 yards rushing in 2-of-3 career meetings with the G-Men. … Melvin Gordon is coming off his first career 100-yard receiving effort. Now it will be time to hit that number on the ground against a shell-shocked Bills club. … Saquon Barkley would have had just 38 yards on 17 carries against the Jaguars without his 68-yard touchdown. But that’s the thing — that’s Barkley’s game. He is capable of flipping the script on any given snap. With the game over early — the Redskins led 24-0 at the 12:13 mark of the third quarter — the Cardinals throttled off David Johnson in the second half. Rookie Chase Edmonds notched eight touches on 17 snaps. Even in a blowout, it was somewhat surprising usage. Johnson’s skill-set is supposed to be game flow proof. Negative game script is going to be a recurring theme for the Cardinals. … For the first time in a full game, Kareem Hunt notched zero receptions in Week 1. He also lost a pair of potential touchdowns to shovel passes. Hunt’s ceiling remains, but the Chiefs’ high-octane passing attack is going to lead to weeks where he gets lost in the shuffle. … Joe Mixon out-touched Giovani Bernard 22-2 in Week 1, playing 44-of-56 snaps. Speaking Monday, coach Marvin Lewis said he “liked” Mixon’s number of catches (four) and believed his carries should be in the 22 range. 22-24 weekly touches are in play. That’s a scary thing for a slimmed down, explosive three-down back. … We are waiting and seeing on Devonta Freeman (knee) and Leonard Fournette (hamstring). Tevin Coleman will be a high-end RB2 if Freeman sits. T.J. Yeldon would be a floor-based FLEX in Fournette’s absence. Corey Grant, a dart throw wild card. Christian McCaffrey’s 2018 got off to a sleepy start against the Cowboys. A trio of injuries should have him looking wider-eyed against the Falcons. As Pro Football Focus’ Scott Barrett reminds, McCaffrey was much more productive without Greg Olsen on the field last season. He will be getting the ball more. He will be doing so against a Falcons defense that just lost MLB Deion Jones and SS Keanu Neal. Not only does that hurt the Falcons’ run defense, it frees up McCaffrey in the passing game, as Jones was one of the league’s best coverage ‘backers in 2017. … After an offseason where coach Matt Nagy said he wanted to feature Jordan Howard more in the passing game, the Bears’ lead back tied a career high with five catches against the Packers. Even with Tarik Cohen Sprolesing, 3-5 weekly grabs is a realistic expectation for Howard. Mitchell Trubisky looks primed to be the one true checkdown/screen/quick out king. … So much for Dalvin Cook being eased in. He played 57-of-71 snaps against the 49ers, touching the ball 22 times. Latavius Murray isn’t going to vulture enough touchdowns to ding Cook’s RB1/2 borderline case. Lamar Miller had one of his best games as a Texan against the Patriots, though he did get vultured by Alfred Blue for a score. His role is RB2 secure. … Alex Collins had a bizarre Week 1, getting punished for a lost fumble by getting out-touched by Kenneth Dixon. Dixon has since landed (back) on injured reserve. Expect a Collins mulligan for a short-week matchup with the Bengals where the runs should be plentiful. … The Redskins are going to ride Adrian Peterson until the wheels fall off. 20-25 touches could go a long way against a Colts defense that just got dominated by Joe Mixon. … Nursing a foot injury, Jay Ajayi played one first quarter snap against the Falcons before checking in to lead the Eagles’ backfield. Coach Doug Pederson has said the training wheels will be off going forward. … LeSean McCoy was my “Do Not Draft” player of the summer. Then I said everything would be fine for Week 1 despite the Bills’ manifold concerns. I was … wrong. All I’m assuming for Week 2 is that McCoy can’t get out-gained by Marcus Murphy again. Rex Burkhead is concussed. Jeremy Hill is ACL’d. Sony Michel (knee) is still rehabbing. The Patriots’ “run game” in Jacksonville could be limited to James White receptions. … Jamaal Williams had a disappointing Week 1. He’s a touchdown-dependent RB2 against the Vikings’ elite run defense. … I’m going to assume game flow will favor Dion Lewis over Derrick Henry until the Titans get a game they’re favored in. … Royce Freeman and Phillip Lindsay had identical workloads and nearly identical snap counts against the Seahawks. With the Broncos big home favorites over the Raiders, I am guessing game flow will favor early-down hammer Freeman. … Speaking of identical workloads, there was Chris Carson and Rashaad Penny. Unlike with Freeman and Lindsay, one player was vastly more productive for Seattle. Pete Carroll said Carson “really took the lead” going forward. Expect workload to match rhetoric against the Bears. … Chris Thompson is a unique weapon who can “poor man’s Kamara” even in standard leagues. … The 49ers are six-point home favorites this week. Alfred Morris should take the Week 1 hot hand from Matt Breida. … LeGarrette Blount’s knee injury ups Kerryon Johnson’s FLEX/RB3 appeal, though it’s still middling. … I have nothing intelligent to say about Bilal Powell and Isaiah Crowell. … Floor for Jordan Wilkins, ceiling for pass-catcher Nyheim Hines. WR Notes: Keenan Allen torched the Chiefs for 8/108/1. It will be interesting to see what rich man’s Keenan Allen Antonio Brown can do. … Julio Jones has 824 yards over his past six games against Ron Rivera’s zone-based defense. … Odell Beckham went 11/111 against the Jaguars’ league-best secondary. Prayers up for the Cowboys. … Coming off one of the best games ever for a Drew Brees wideout, Michael Thomas gets a Browns defense that allowed 212 combined yards to Antonio Brown and JuJu Smith-Schuster. Brees and Thomas will find the same holes the Steelers did. … DeAndre Hopkins is nursing a foot injury. It doesn’t sound like it will be a concern against the Titans’ soft secondary. … The following Ravens had at least one 20-yard reception against the Bills: John Brown, Michael Crabtree, Willie Snead, Nick Boyle and Maxx Williams. Keenan Allen is licking his chops. … Five of Tyreek Hill’s seven Week 1 receptions gained at least 20 yards. This was against an elite Chargers secondary. He’s one of the most unique talents in the league. A.J. Green rarely hits his ceiling against the Ravens. … Adam Thielen ate the 49ers up out of the slot. He’s going to pose all sorts of problems for rookie Packers nickel CB Jaire Alexander. … The Steelers’ narrow offense gives JuJu Smith-Schuster both an unusually high floor and ceiling for a No. 2 receiver. … Mike Evans took out his 2017 frustrations on Marshon Lattimore in Week 1, dismantling one of the league’s top corners in their 1-on-1 matchups. The Eagles don’t have anyone quite that imposing, but their overall unit is so much better. The FitzMagic will be in much shorter supply. … Emmanuel Sanders’ preseason chemistry with Case Keenum carried over to the opener. At least for one game, the Broncos nearly doubled Sanders’ slot usage. Sanders appears back to being a high-upside, every-week WR2. … Stefon Diggs had a quiet Kirk Cousins debut. An expected heavy dose of Tramon Williams should help change that against the Packers. ... Davante Adams will do frequent battle with lockdown CB Xavier Rhodes as Aaron Rodgers tries to beat the Vikings on one leg. Via FantasyInsiders’ Ben Gretch: Jarvis Landry’s Week 1 average depth of target was 13.9. He never averaged more than 7.7 for a season in Miami. One game is one game, but the Browns seem like maybe they were telling the truth when they said they wanted to expand Landry’s horizons beyond the shortest area of the field. … Sam Bradford is the latest bad quarterback Larry Fitzgerald has had to endure. Bradford’s Week 1 performance was a sad spectacle. Start the Josh Rosen countdown clock. … It looks like Emmanuel Sanders might finally have the upper hand on Demaryius Thomas, but Thomas still caught 6-of-10 Week 1 targets for 63 yards and a score. With little in the way of target competition, Sanders and Thomas will both get their numbers. … The Cardinals are leaving Patrick Peterson stationary this season. That’s excellent news for Brandin Cooks. Matchups wiz Sean McVay should have little trouble freeing Cooks up for good looks after he went 5/87 in the opener. … T.Y. Hilton should avoid Josh Norman’s shadow, but we know all about his home/road splits. That, coupled with Andrew Luck’s checkdown bonanza in Week 1 make Hilton a pure WR2. The Bucs got annihilated by the Saints’ receivers last week and have now lost nickel CB Vernon Hargreaves for the season. That’s good news for Eagles slot man and current No. 1 wideout Nelson Agholor. … Golden Tate’s Week 1 usage was about what we expected. Outside was where the intrigue was for the Lions. Is Kenny Golladay already forcing his way past Marvin Jones on the depth chart? I’m obviously not making the switch after one game, but it is something that will remain on the brain. … Corey Davis’ 13 targets against the Dolphins were easily a new career high. Now Marcus Mariota has lost No. 1 weapon Delanie Walker. That’s good news for Davis and even better news for Rishard Matthews, who was invisible in the opener after a summer lost to injury. Matthews will be badly needed over the middle of the field. 65.4 percent of his Week 1 routes originated from the slot, compared to just 33.1 in 2017. … Kenny Stills: Good at football. … The Browns accidentally started Josh Gordon in Week 1. He then quite purposefully played 69-of-89 snaps, flukily drawing only three targets. Marshon Lattimore is not going to get embarrassed in back-to-back weeks, but Gordon should do enough for a WR3 day. Devin Funchess was far more productive whenever Greg Olsen was sidelined last season. Olsen is out indefinitely. … Tyler Lockett is kicking inside in Doug Baldwin’s (knee) absence. The Bears could not contain Randall Cobb out of the slot in Week 1. … If Marquise Goodwin (bruised thigh) can get cleared, he will have an appetizing matchup in a Lions secondary that got torn apart by the Jets. … The Quincy Enunwa summer prophecy came true. He is going to be a major factor over the middle of the field for a team without a preferred pass-catching tight end. … DeSean Jackson (concussion, shoulder) appears poised to sit. Chris Godwin would almost be guaranteed to go bonkers if the Bucs were facing a softer defense than Philadelphia. As it is, he is still set up for a volume-based WR3 day. … Coach Jon Gruden has basically already admitted that Amari Cooper won’t be able to bust his slump against the Broncos’ tough secondary. He also not so subtly suggested Derek Carr needs to do a better job finding his No. 1 wideout. … Brandon Marshall for cheap floor. Geronimo Allison for cheap upside. Kelvin Benjamin for delete your account. TE Notes: Rob Gronkowski was off to a slow start against the Jaguars in the AFC Championship Game before suffering a second quarter concussion. He still gets the Week 2 benefit of the doubt, especially with the Pats so thin at receiver. … Speaking of thin at receiver, the Eagles are really hurting without Alshon Jeffery. Zach Ertz received 10 Week 1 targets. That’s his over/under for the foreseeable future. … Coming off one of the quietest games of his career, Travis Kelce gets a Steelers defense that held him to 4/37 in 2017. Without Alex Smith checking it down every other play, Kelce could be more boom-or-bust this season. … Aside from literally dropping an 80-yard touchdown, George Kittle’s Week 1 was about as encouraging as possible. He posted the fourth-most tight end yardage of the week (90) and the third-most tight end targets (nine). Two of his looks came in the red zone, with one being an end zone overthrow from Jimmy Garoppolo. Perhaps Marquise Goodwin being sidelined played a part, but Kittle looked every bit ready to play a leading role in the 49ers’ offense. Healthy, Jordan Reed posted 4/48/1 on five targets before the Redskins called off the dogs against an overmatched Cardinals team. Despite some promise in their safety group, the Colts don’t have the defenders to slow Reed down. … The Vikings’ elite defense couldn’t contain George Kittle. Jimmy Graham is a different kind of player but only an Aaron Rodgers absence would knock him down the Week 2 rankings board. … Before you scream “recency bias” at my Jared Cook ranking, remember that the Broncos just gave up 3/105/1 to “Will Dissly.” There’s also the matter of the Raiders having literally no one else to throw to. “Jared Cook weeks” have a way of ending poorly, but his setup is strong. … Trey Burton’s Week 1 usage went according to plan. His biggest risk is not a lack of targets but a lack of quality targets from shaky sophomore starter Mitchell Trubisky. Andrew Luck’s BFF Jack Doyle drew 10 Week 1 targets. Luck will continue to look his way as he rehabs his arm. Eric Ebron is just a TE2 dart throw despite his solid opener. … David Njoku played 78-of-89 snaps against the Steelers and was second on the Browns in targets (seven). Stay the course. … Ricky Seals-Jones dropped a touchdown against the Redskins, but he drew six targets and played 49-of-53 snaps. Excellent usage. … Charles Clay had a zero-look Week 1. The target-starved Bills are going to ensure that does not happen again. … Fourth-round blocker Will Dissly randomly decked the Broncos for 3/105/1. That will probably go down as his best game of the season, but it’s not like he’s facing stiff target competition. … Jonnu Smith and Ian Thomas are both athletic freaks. With a year of NFL experience and some actual production under his belt (18/157/2), Smith is the much safer call for TE2 desperados left in a lurch by Greg Olsen and Delanie Walker’s injuries.